The Lowe's location in Bangor. Lowe’s is closing stores in Ellsworth and Biddeford as part of a wider decision to shut down 20 stores nationwide, according from a release from the home improvement chain. In the statement, the Mooresville, N.C.-based company said that 10 of the “underperforming” stores closed at the end of the business day on Sunday, Oct. 16, and the rest will close in about one month from now. Lowe’s said it still expected to open approximately 25 stores in 2011 and to open between 10 and 15 per year in North America going forward. Glenn McGrath, a Lowe’s market director who was at the Ellsworth store Monday morning, said the store will be open until Nov. 13. According to Lowe’s officials, the Ellsworth store, which opened in January 2008, has 83 employees — 51 full-time and 32 part-time. According to the city assessor’s online database, the 17-acre lot where the local Lowe’s store is located is owned by Lowe’s and has an assessed value of $16 million. The property generates more than $233,000 per year in local property taxes, the public database indicates. 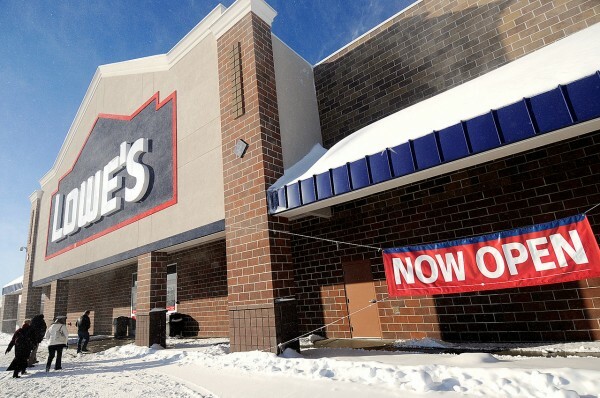 An outgoing phone message at the Biddeford store said Monday morning that the store is permanently closed and directed business inquiries to the Lowe’s store in Scarborough. According to additional information provided by Lowe’s Monday morning via email, the Biddeford store had 102 employees — 59 full-time and 43 part-time. That store opened Oct. 24, 2006. The Journal Tribune reported Monday the closing in Biddeford is the latest blow to The Shops at Biddeford Crossing, which also lost a Linens ‘n’ Things, an Old Navy, and two restaurants in recent years. McGrath said employees in Ellsworth will receive pay and benefits for 60 days after the store shuts down and will be eligible for other available Lowe’s jobs at other locations. The company plans to work with government agencies to help laid off employees find other jobs, he said. “It’s a sad day here,” he said. Besides the Ellsworth and Biddeford locations, Lowe’s has 11 other stores in Maine between Presque Isle and Sanford. Lowe’s President and CEO Robert A. Niblock said in a prepared statement that Lowe’s remains committed to generating shareholder value and creating long-term customer loyalty. The closings are expected to result in approximately 1,950 employees losing their jobs nationwide, the company said. Those affected will receive pay and benefits for two to three months, Lowe’s officials said. Other Lowe’s stores in New England that are closing are three in New Hampshire — in Claremont, Hookset and Manchester — one in Haverhill, Mass., and another in North Kingstown, R.I.
Lowe’s stores are also being closed in Los Banos and Westminster in California; Aurora and Oswego in Illinois; Old Bridge, N.J.; Batavia, N.Y.; Denver, Colo.; Ionia, Mich.; Rogers, Minn.; Emporia, Va.; S. Tacoma, Wash.; Chalmette, La. ; and Brown Deer, Wis. According to the company, Lowe’s had sales of $48.8 billion in 2010 and has more than 1,700 stores in the United States, Canada and Mexico.